Know what's lurking inside your lawn. 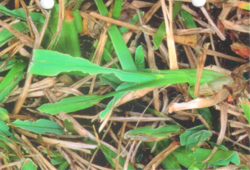 This is the most important pest of St. Augustinegrass in Florida. Nymphs range from 1/20 of an inch to about 1/5 of an inch and are reddish with a white band across their backs, but become black as they mature. Adults are 1/5 inch long and black with patches on their backs. Eggs are deposited in leaf sheaths. Each female lays an average of 300 eggs during her lifetime. Chinch bugs have five nymphal instars. Each generation develops in six to eight weeks, but all life stages occur simultaneously. There are at least three generations a year in north Florida and seven to 10 in south Florida. Chinch bugs withdraw the plant fluids with piercing-sucking mouthparts. Additional damage occurs from phytotoxic effects of saliva injected into the plant, which causes yellowish to brown patches in turfgrass. Injury is more prevalent in full sun and under dry conditions. Damage is often first noticed near driveways and sidewalks. If chinch bugs are suspected, look for them by parting the grass at the edge of the off-color areas and examining the soil surface. Or, use a hand-held vacuum cleaner and empty it on the sidewalk. Examine at least three or four places in suspected areas. 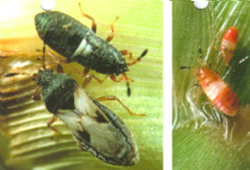 If chinch bugs are the problem, they will be crawling on the soil surface. This is one of the most common caterpillars attacking turfgrass. It attacks all grasses but prefers bermuda and least desires bahia. 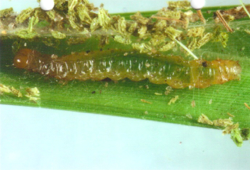 Larvae are greenish with numerous black spots, and 3/4 inch long when mature. Adult moths are dingy brown, with a wing span of 3/4 inch. During the day, the moths rest in shrubbery next to turf areas and at dusk, fly over the turf depositing eggs. After seven larval instars, they pupate and emerge as moths in one week. Life cycle is five to six weeks at 78 degrees F. Sod webworms are usually not a problem until June in south Florida, July in central Florida and August in north Florida. When first hatched, they only rasp the surface or skeletonize the blades. Damaged areas appear greyish and are usually two or three feet in diameter. Often, damage is first noticed along hedges or flower beds. As the larvae mature, injured grass has notches chewed along the sides of the blades or is eaten back unevenly. Damaged areas become larger and fuse. Sod webworms feed only at night and rest in a curled position on the soil surface during the day. If the grass is parted, green frass may be seen on the soils surface. 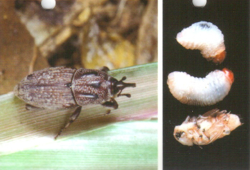 Several different white grubs infest warm-season turfgrasses, especially the masked chafers, May or June beetles, surgarcane grub, ox beetle, ataenius beetles, and others. White grubs are the C-shapted larvae of scarab beetles. Most of the species have one-year life cycles. The eggs are laid in the soil, usually from April through June. The grubs feed on grass roots or organic matter until the following spring. Larvae stop feeding and pupate in the earthen chambers deeper in the soil. 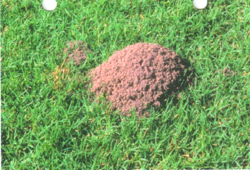 Some adults may make mounds when exiting the soil or when laying eggs. If a mosaic pattern of yellowish areas develops, or if the grass consistently wilts in an area even though adequate water is available, an infestation of grubs should be suspected. When turf is easily pulled from the soil with little evidence of roots snapping and some grubs are present, it is almost certain that grubs are responsible. To confirm this, use a spade to cut three sides of a one-foot square piece of sod about three inches deep at the edge of one of the off color areas. Force the spade under the sod and lay it back. See if the grass roots are chewed off and sift through the oil looking for the larvae. Check several places in the turf area. 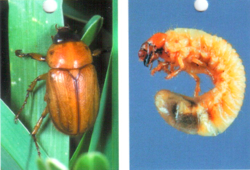 The billbug complex (five species) occasionally causes problems on turfgrass in Florida. 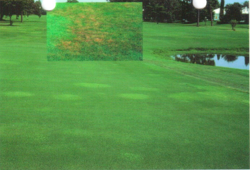 Damage is difficult to diagnose, and is often mistaken for drought, disease, or delayed spring green-up. Zoysia and burmudagrass are the favorite hosts but they also attack bahai, St. Augustine grass and centipedegrass. Adults are about 3.8 inch long and typically weevil-like, with a short, fairly broad, recurved snout. They are grey to black,but are often covered with soil, giving a dirty appearance. Eggs hatch in three to 10 days. The larval stage is three to five weeks. Mature larvae are 3/8 inch long and legless. The body is white with a tan head capsule. Adult female billbugs chew cavities in the grass stems near the crown and deposit eggs. Larvae feed inside stems and rhizomes. The immobile, legless larvae cause small, irregular areas of dead grass resembling dollar spot disease. When they outgrow the stems and rhizomes, larvae migrate down and eat the roots. Larvae are 1 to 3 inches deep in the soil among roots and runners. Injury is more pronounced during extended dry weather and low fertility. To see if billbugs are causing the problem, inspect the root zone as discussed for grubs. The treatment threshold is about 10 to 15 larvae per square foot. The red imported fire ant builds a rounded, conical nest or mound often two or three feet across. The fire ant has spread widely since the 1930s and infests all Florida counties. The ants are 1/8 to 1/4 inch long, and reddish-brown to black. They are social insects and live in colonies that may have up to 200,000 individuals. This ant has a painful, burning sting that causes pustules, which may take up to 10 days to heal. If broken, the pustules may become infected. Some people exhibit an allergic reaction to the fire ant stings. A few have died as a result of allergic responses to the stings, but this is very rare. Both the adults and larvae of ground beetles prey upon harmful insects. As the name suggests, they are usually found on the ground, and are most active at night. 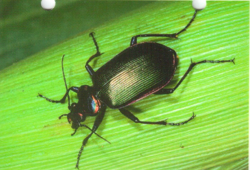 Adult beetles are 1/3 to 1 inch in length and generally black but often may be metallic-colored. They prey on some of our most serious lawn, vegetable and field-crop pests, including webworms, army worms, cutworms, corn earworms, small mole crickets and others. 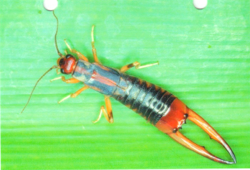 Earwigs have forceps like cerci that can be used to capture prey or to defend them against predators. Earwig adults are 1/4 to 1 inch long. Their bodies are flattened and are pale to dark brown. The antennae are threadlike and about half the length of the body. they lay their eggs in the soil, but adults may hide in mulch or shrubs. They are active at night and often crawl into homes under doorsills. They are attracted to light and are beneficial, eating insects and other pests. 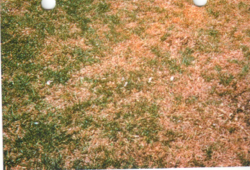 The fungus causing this disease was first described from bermudagrass. Since then, the fungus has been associated with bahia, centipeded, St. Augustine and zoysia grasses in decline situations. 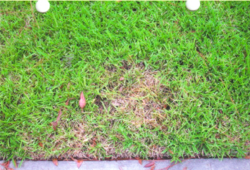 This fungus causes take-all root rot on St. Augustinegrass. Symptoms develop first as chlorotic or off-color patches and may range from 6 inch to 24 inch diameter. Hot summer and fall periods favor symptom development. Damage occurs on bermuda areas where mowing height is shortest and/or turf is under greatest stress. There are no leaf spot symptoms. Roots are short, with dark lesions and few feeder roots. Affected areas brown and die reflecting water stress due to the root system decay. 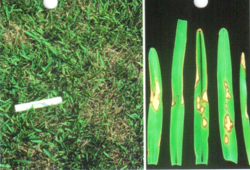 This disease affects all grasses but is most severe on bahia, bermuda and zoysia. Disease is most common in the 60 to 80 F period of spring and fall but can occur in summer. 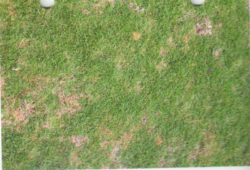 Dollar spot is a disease of low-fertility (low N and K) turf areas. The fungus survives in thatch and requires either fog, dew or irrigation to invade. Affected turf areas may be 1 to 2 inches in diameter or larger. Dollar spot resembles brown patch except for leaf spots. Leaf lesions are marginal, irregular, light-tan spots with reddish brown borders. During moist morning periods, the white strands of the fungus may be seen in the infested turf areas. $25.00 Off Your First Treatement with an Annual Service Agreement! Print this ad and receive a discount on your first treatment. Mention us to your friends for additional savings. Ask us how! America's Lawn Savers and Your Pest Control for all your pest needs! We are committed to providing the best possible service at competative prices! Being locally owned, we understand how to serve the needs of our Tampa communities in order to bring you the service and quality you deserve. Get to know us and we're sure you'll be happy!